Boxing promoters Don King Productions and Golden Boy Promotions will include a World Boxing Council United States heavyweight national championship, a World Boxing Association Fedecaribe regional junior lightweight championship and a handful of boxing’s top undefeated rising stars on the non-televised undercard of the Showtime Bantamweight Tournament Final: Winner Takes All that pits International Boxing Federation bantamweight champion Joseph King Kong Agbeko against undefeated WBC silver bantamweight champion Abner Mares on Saturday, Aug. 13 at the Hard Rock Hotel & Casino in Las Vegas. In a 12-round round bout, WBC No. 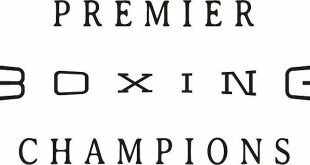 12-ranked heavyweight contender Eric “Drummer Boy” Molina (17-1, 13 KO’s), from Lyford, Texas, will take on Warren “The Hit Man” Browning (14-1-1, 9 KO’s), from London, Ky., for the WBC U.S. heavyweight national championship. The WBA Fedecaribe super lightweight title will be on the line when undefeated Cuban-born Angelo “La Cobra” Santana (10-0, 7 KO’s), from Miami, Fl. squares off against Jesse Carradine (7-1-1, 3 KO’s), from Cincinnati, Ohio in a nine round fight. Former interim WBO Bantamweight Champion and former WBA Flyweight Champion Eric Morel (44-2, 22 KO’s), born in Puerto Rico but now fighting out of Madison, Wis., will be featured in a bantamweight attraction scheduled for 10 rounds against Daniel Quevedo (13-11-2, 8 KO’s) from Los Angeles, Calif.
Undefeated lightweight rising star Luis Ramos Jr. (19-0, 8 KO’s), from Santa Ana, Calif., will risk his perfect record against “Dangerous” David Rodela (15-4-4, 6 KO’s), from the boxing hotbed of Oxnard, Calif., in an battle slated for 10 rounds. Also in action will be rising star Carlos Molina (14-0, 7 KO’s) of Norwalk, Calif., who will put his unbeaten record on the line in an eight round junior welterweight bout against an opponent to be named. Eric Molina is an intriguing heavyweight prospect. His dream is to become the first Mexican American heavyweight world champion, and he’s off to a good start. He’s a hard worker inside the gym and in life as evidenced by the fact he earned a bachelor’s degree in interdisciplinary studies from University of Texas at Brownsville and has volunteered to work with special needs children in his native Texas. He’s a tall, rangy boxer at 6 foot 6 inches, but his Mexican toughness comes out in the ring as he is a busy heavyweight. Possessing an 84-inch full reach, he can cause problems for any opponent. Molina will be tested by Warren Browning, a former Toughman champion, who fought undefeated cruiserweight Ryan Coyne last summer and was within striking distance of pulling an upset going into the ninth round before being caught with a punch on the ear that ended the fight. Eric Morel is on a nine-fight winning streak that dates back to 2005. The 35-year-old, who turned professional in 1996, won the WBA flyweight world title in 2002 and made five successful defenses. He is coming off of a fourth-round technical knockout over former world title challenger Luis Maldonado on April 1. 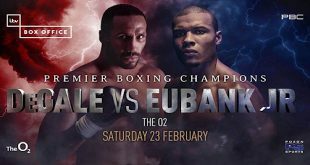 Morel will face the younger Quevedo, a 27-year-old on a three-fight win streak that includes two early knockouts in 2011. Undefeated lightweight Angelo Santana has one of the most interesting back stories in boxing. Like so many Cubans before him, Santana jumped onto a makeshift raft with 27 others in the summer of 2007 and washed up in Miami three days later. Just 10 days later, a boxing manager brought him to the attention of Don King, who signed him immediately. Four months later, Santana’s first appearance as a professional came when he appeared at Madison Square Garden on the undercard of Felix Trinidad vs. Roy Jones Jr. He won that night and has won every night since. Santana looks to maintain his perfect record against Jesse Carradine (7-1-1, 3 KOs) of Cincinnati. Carradine had a successful amateur career and is tall for his weight at 5 feet 10 inches. A skilled boxer, he excels when he can keep shorter opponents at a distance where he can ply his craft. Carradine also benefits from the wisdom and sage advice of trainer Donald Turner, who guided Evander Holyfield and other greats of the sport. Rising lightweight star Luis Ramos Jr., is coming off the biggest win of his career against former world title challenger Francisco Lorenzo on June 3. The 23-year-old undefeated southpaw, a former amateur star who has also defeated respected veteran Walter Estrada, will face another tough test against David Rodela in the first 10-round fight of his career. The 29-year old Rodela has paid his dues with wins over Kevin Kelley, Julio Gamboa and Gamalier Rodriguez on his way to this all-Southern California showdown. Also hailing from Southern California is Norwalk junior welterweight prospect Carlos Molina. A professional since 2007, the 25-year-old Molina has made steady progress through the competitive local circuit, drawing rave reviews along the way. 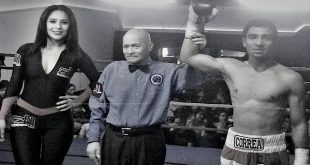 In his most recent bout, Molina scored a near shutout win over John Figueroa last November and after a minor injury that sidelined for the first half of 2011, he is eager to get back in the ring and continue on his road to the top. The highly anticipated 12-round world title match and Bantamweight Tournament Final between Joseph Agbeko (28-2, 22 KOs), from Accra, Ghana, and Abner Mares (21-0-1, 13 KOs) of Hawaiian Gardens, Calif., by way of Guadalajara, Jalisco, Mexico, was originally scheduled for April 23, but was postponed when Agbeko was injured moments after arrival at Los Angeles International Airport during fight week. Doctors at a nearby hospital diagnosed the champion with sudden onset sciatica, a back injury. 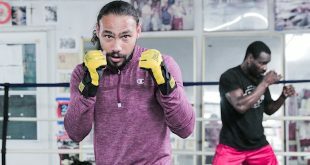 Agbeko, who had never previously missed a fight, was told by a Los Angeles physician to receive treatment and wait six weeks before resuming training after the April 23 postponement. He has resumed training and will be fully fit to face Mares on Aug. 13. The Bantamweight Tournament Final: Winner Takes All is promoted by Don King Productions and Golden Boy Promotions and is sponsored by Corona. Tickets, priced at $200, $100, $75, $50 and $25, along with a limited number of VIP suite seats priced at $150, are on sale now and may be purchased at the Hard Rock Hotel Box Office, all Ticketmaster locations, online at www.Ticketmaster.com or by phone at (800) 745-3000.